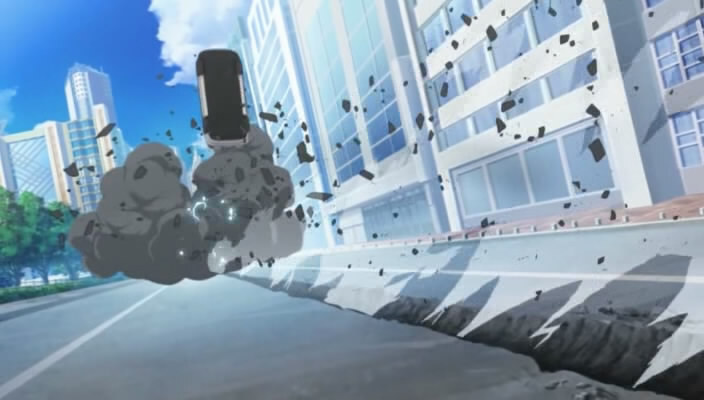 How is Misaka's railgun so destructive? 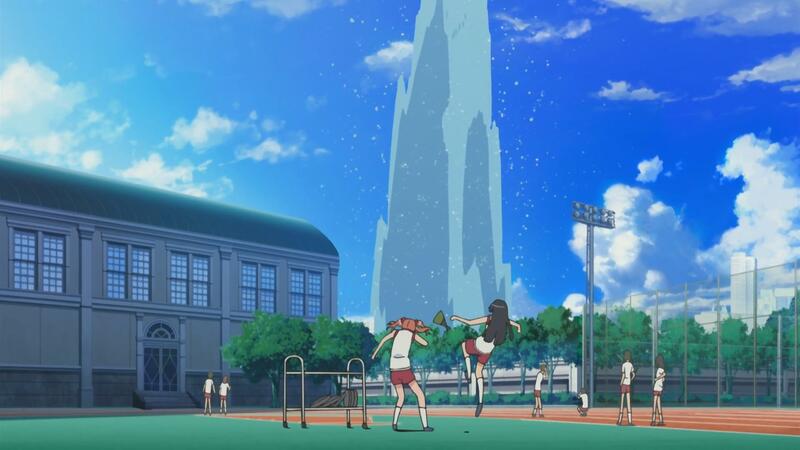 In episode 1 of Railgun, Misaka's railgun up-ends a good chunk of what appears to be an olympic-sized swimming pool. 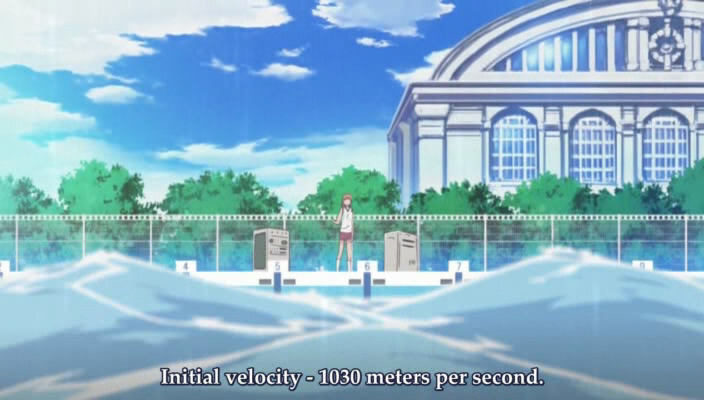 Later in the same episode, it is revealed that her railgun travels at a velocity of 1030 m/s. However, the numbers don't add up. An olympic-sized swimming pool has 2,500,000 kg of water. Based on the image above, that cone probably travels a good 100 meters into the air. So let's say for benefit of the doubt, that only 10% of the water is lifted 100 meters into the air. The coin needs 2.45 * 10^8 Joules of energy to uplift the swimming pool as shown above. But her coin can only provide 5304.5 Joules. There is a difference of about 4 orders of magnitude. The spin of the coin is not captured in the net velocity of 1030 m/s. But given the moment of inertia of a little coin, it would need a tremendous (relativistic?) amount of spin to carry 10^8 Joules. The charge of the coin is unspecified in the Anime. Perhaps Misaka somehow polarizes the charge in the coin and somehow makes it release upon contact with the target. The mass-energy (E = mc^2) of the coin is 9 * 10^14 Joules. Is this what she did? So the question is: Is there any official explanation for where the coin gets so much energy? Or are we left to dismiss this as another case of Anime physics? In contrast, the US Navy's railgun has a muzzle velocity of 2520 m/s (~5600 mph or ~7.5x the speed of sound), with a muzzle energy of 10.64 megajoules (10.64 million joules). Which is probably comparable to the amount of energy in an average-sized car moving at 250 mph. Comparatively, the an AK-47 rifle has a muzzle velocity of 715m/s (~1600 mph or ~2x the speed of sound), with a muzzle energy of ~2010 joules (assuming 7.62x39mm cartridges are used, but may vary depending on the type of ammunition). While not very impressive stat-wise as far railguns go, since actual railguns are capable of achieving speeds of possibly more than ~5000 m/s. Take note that Mikoto is a middle-schooler that can fire eight shots of these per minute, which is on par with "typical" railguns. So Mikoto outputs a bit more damage than an semi-automatic assault rifle. But that's not what we're seeing now is it? Not quite. But what could cause such a difference in output? According to Page 1, Chapter 4 of the Railgun manga, she manipulates electromagnetism to achieve her results. This seems plausible since if the magnetic field were sufficiently focused, she could theoretically accelerate only the coin and/or nearby objects. Lets measure things in terms of Kuroko's height (~152cm)! 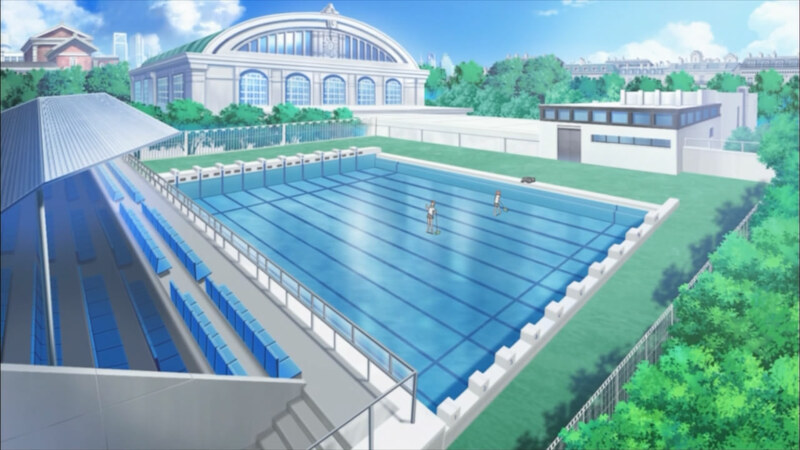 Seeing as the pool doesn't taper or either end, lets assume that the pool is about 14 Kurokos long or ~21.28 m (yes it does seem kinda small), and about 11 Kurokos wide, or ~16.72 m, by the lines on the pool floor and a bit less than ~0.9 Kuroko, or lets say 1.36m deep. (Energy it takes to lift an object) = (mass of object)*(acceleration due to gravity)*(lift altitude). So the muzzle velocity of her railgun would be ~4368.04 m/s. One can only assume that, since we must respect the canon value of 1030 m/s, that perhaps the damage caused by Mikoto ability is due to her manipulation of electromagnetic caused as the coin moves through the air or some other factor... But then again, what do we know about the physics of this world where Science and Magic co-exist? The wiki says that Misaka can generate 1 billion volts. If she charges the coin, the rapid transfer of charge from the coin to the water would cause repulsion between the coin and the surrounding water, propelling the water away from the pool. The shockwaves would reflect on the borders and the bottom of the pool, pushing the surface water up. You can see in the anime that all the blasts have some sideways movement, but the SECOND blast displayed has a very distinctive. sideways movement, hinting that the impact pushes the water a bit to the sides as well, as the electrically charged water moves away from the coin while the coin traverses the pool. The issue of the charge dissipating is not a problem. She can AIM lightning, so we can assume her electromagnetic powers can also alter the breakdown voltage of the air around the coin (by either increasing the pressure around coin or making vacuum. half the charge has transferred to the water. the walls and bottom of the swimming pool are totally isolant and indestructible. the coin has hit the bottom once half the charge is transferred. We are getting to the Megajoule Here. Even if you were to take into account the charge dissipation, the diminishing repulsion force between the water, and other small assumptions here, there is plenty of energy for everything. There is plenty of energy everywhere to be used any way you want. But I think this clearly explains where the energy to lift the water comes from. you can see that the amount of stored energy is greater, and so is the destructive power. Makes sense, because the capacitance of those items is bigger than a coin's. Many thanks to Wolfram Alpha for the calculations and images. Electricity can keep accelerating the coin even after it left the "muzzle". The coin's Spin and one of most destructive forces: Harmonics. 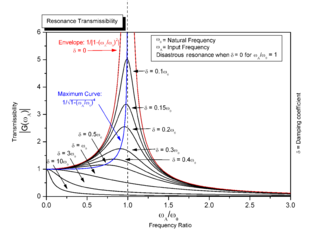 As we can see from this wikipedia graph, once maximum resonance (1:1) is reached, the energy transfer increases dramatically. Wind Harmonics are enough to destroy a bridge by moving it like a violin string. If she can spin the coin so its frequency matches perfectly the harmonic frequency of the pool, massive energy could be transfered. While subjective, it was my strong impression from the start that projectile component is indirect (and possibly borderline irrelevant) to her ability. The projectile might be just a beacon or focus type of component, possibly purely psychological one (with technique being opposite of just randomly shooting out bursts of uncontrolled electricity). I remember her shooting large projectile in later episodes, however, the speculation above might still apply. I argue that it is a case of Anime Physics by refuting the alternative possibilities you suggested. You're right - carrying such an amount of energy as moment of inertia is impossible. Even Misaka's superpowers are a world away from relativistic speeds. The energy cannot be stored as charge in the coin, as it would keep dissipating as "lightning". The energy couldn't have come from mass energy. Besides the resulting lethal radiation, to release mass energy without using antimatter would mean releasing nuclear energy. Nuclear energy can only be released under extreme pressure (nuclear reactions in bombs are initiated by compressing Uranium with the blast of a smaller bomb). If someone could find an example of Misaka finding her coin after she shot it, that will clearly refute the mass energy argument. Finally, the Mythbusters proved in this video that a coin travelling at 3 times the speed of sound (around the speed of a bullet) merely dents concrete. Thus, an alternate though less-interesting explanation of the disproportionate effects of her railgun would be something along the lines of: Misaka's own perception of how powerful the railgun should be is wrong, resulting in exaggerated effects. .82 is the drag coefficient for a long cylinder like an arcade coin, 1000kg/m^3 is the density of water, and .000042455m^2 is the cross sectional area of the coin fired. if we perform the equation in reverse to find out the velocity of the coin in air, we are left with a velocity of 29,428m/s. Sounds a hell of a lot more like a proper rail gun, doesn't it? 'A Certain Magical Index' has 50 odd light novels, 13 volumes of manga, 2 seasons of anime, a movie and a couple of video games. 'A Certain Scientific Railgun' has 2 light novels, 11 volumes of manga, 2 seasons of anime, an OVA, and a video game of its own. In none of these sources (that I can recall, anyway) is Misaka's railgun trick implied to be anything other than an arcade token (not a coin, which is why it is even ferrous to begin with) travelling three times the speed of sound. Since Touma can dispel it, that means that there is still something supernatural about the coin, even while it is melting. That supernatural property will be why it has a pushing force well above what it should have on momentum alone. I have no evidence for my next point, but I believe that Misaka's magnetic field is simply continuing to push the coin well after it leaves her hand. That would explain both oddities nicely. Let's not forget in the episode she did the robot arm she did so because the person was sitting outside the range of her coins. At the end of the beam there was simply no coin left. She explained as she blocked, caught, and fired said arm that there is a reason she usually uses coins. I suspect several factors combine to contribute to her destructive potential including her designated badass status, continued acceleration, inertia, spin, hypersonic shockwave, and possible conversion of matter to plasma. Remember she also probably diverting energy to fight recoil and other destructive aspects of firing the railgun. That shielding is sufficient to stop directed multiple nuclear blasts capable of rapidly melting through concrete and steel despite Misaka being exhausted at the time. I'm sure this might be sufficient energy cause a secondary acceleration. Not the answer you're looking for? Browse other questions tagged a-certain-magical-index a-certain-scientific-railgun or ask your own question. Is it physically possible to turn a mahjong tile white with a super grip? What does reversing a person's bioelectricity do? 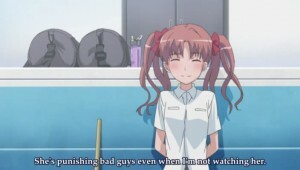 What was the motive for kidnapping Eri in the 1st episode of Railgun season 2? For how long were Accelerator and the Sisters doing the Level 6 experiment? What book is Saten reading to Febri in episode 19 of Railgun S? How does Mikoto know about the Sisters before the Sister's Arc? What is the Toaru Kagaku no Railgun manga release schedule? Where is the first track of Toaru Kagaku no Railgun S OST 2 first played? How does Mugino Shizuri's Meltdowner beam work?